When evaluating the price of a college education, it's important to look not only at a school's cost of attendance, but also the starting salaries of its graduates. After all, a larger initial investment could turn into larger salaries down the road. That, in and of itself, should dispel the misconception that public school tuition is more affordable, and therefore easier to pay off in the long run. CommonBond's dive into March Debtness confirms it. CommonBond, a New York City-based financial technology startup that aims to make higher education more affordable, created our own spin on a bracket for the NCAA men's basketball tournament – known more famously as March Madness. The company's bracket, March Debtness, looks at how long it takes each school's students to pay off their student loans. 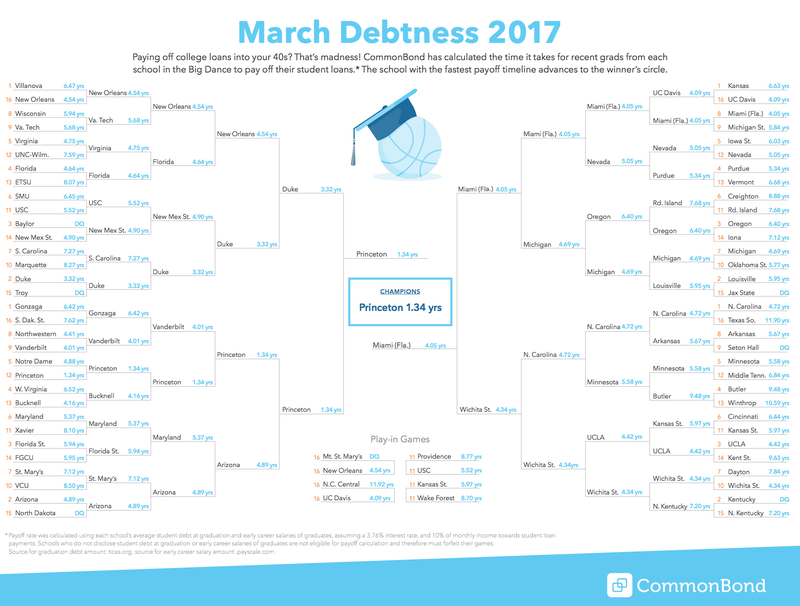 To determine which school would win each matchup in our bracket, the CommonBond team used an algorithm common to student loan payoff. The formula calculates the number of payment periods for an investment, based on consistent periodic payments and a constant interest rate; we assumed a 3.76% interest rate, which is the average federal direct subsidized undergraduate student loan interest rate. We also assumed that all graduates are eager to pay off their student loans, so would allocate 10% of their early-career income to pay off their loans. Early-career salary data came from Payscale.com, and average student debt came from The Institute for College Access and Success (TICAS). We updated our data this week to decide the winners from the Sweet – make that, Savings 16 and beyond. Click the image below for a larger version of the bracket. While CommonBond is all about making higher education more accessible, we created this bracket to put into context just how long it can take to pay off loans and congratulate the graduates from the schools that are doing it the fastest. We previously ran the numbers on Selection Sunday before day one of the tournament. Those results showed that for the full field of 64, the top-performing schools weren't necessarily more likely to be publicly-funded. Take the private Vanderbilt University, a No. 9 seed whose basketball team narrowly lost in round one, as an example. Its graduates record debt that averages more $21,000 while earning early-career salaries of almost $58,000 – the study's average was just north of $49,000. As a result, Vandy cracked our top three for schools with the fastest debt payoff. Princeton, which was seeded 12th in the tourney before being knocked out by No. 5 in Notre Dame in the first round, won our initial Debtness title. To view the bracket as it looked for the round of 64, click here: CommonBond March Debtness 2017. Below are our 10 fastest-paying teams at the outset. Six of them are private universities.